Left to right: Simon Dunton, Steve Williams, Joe Thwaites, Nick Graham. Although there are plenty high calibre surfers in Scotland, the SUP surfing scene is relatively new so it is a special occasion when you get eight surf SUPers together in one place. 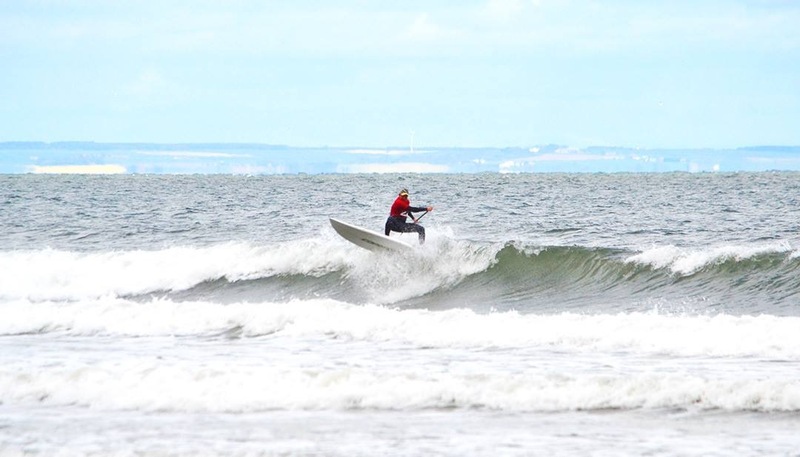 That’s what happened at last Saturday’s Coast to Coast Surf School Longboard/SUP competition held at Belhaven Bay in East Lothian. The surf school has been trying for the last few years to get a SUP surfing scene going but it has been a slow process with little or no turnout of SUPers at the yearly competition. This year was different, mainly because the surf school had managed to get some SUP surfers together the previous year for a Surf Sprint fun event. A small band of SUPers kept in touch with each other since then and started up a Scottish SUP Facebook page (www.facebook.com/groups/supinscotland) which now has about 330 members and growing fast. It was through the lively online banter and connections with SUPers elsewhere that interest in this year’s SUP competition gained more interest. In the week running up to the comp everyone was watching the forecast as it wasn’t looking too great for stand up. There was a reliable swell due to come in but the wind was going to be a problem – it was to blow up to 25 mph in the afternoon. 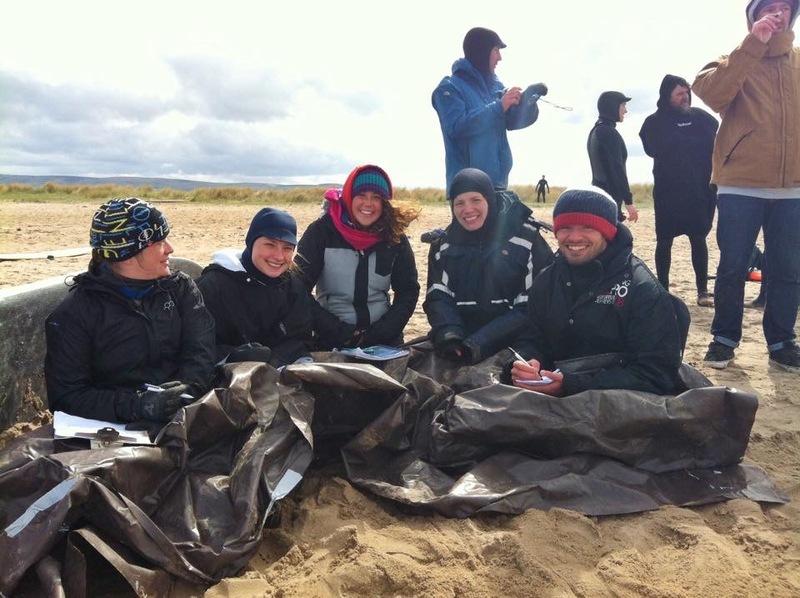 Some of the judges trying to keep warm but still smiling! Despite the forecast and in true Scots style, the event was called on and paddlers started to register. Eight paddlers turned up on the morning of the event to hail, sunshine, rain and winds – typical Scotland you might say! Half of the paddlers had traveled up from around the Newcastle and Saltburn area, showing great support and commitment to helping get a surf comp scene going. In fact, their participation brought the competition alive as Sam Christopherson of C2C Surf School explained. “In Scotland we have a small number of SUP surfers who can hold their own on a wave but we can’t match the skills of SUP surfers in England and in Wales…..we just haven’t built up those skills yet and it will take time. Having these guys come up and show us their moves gives us Scots something to aim for. The finals heat was carried out in really strong winds which tested all the paddlers….just standing up was a real challenge but waves were had…even though they were small at that stage. On competition day, Nick Graham of Saltburn was the stand out winner of the event, showing longboarders and the other SUP surfers how to cut back in style. Strong winds didn’t seem to have any affect on Nick whose watertime experience was very evident. Starboard rider and SUP North instructor Simon Dunton battled with the conditions to come a close second and Loco boss man Joe Thwaites in a respectable third. 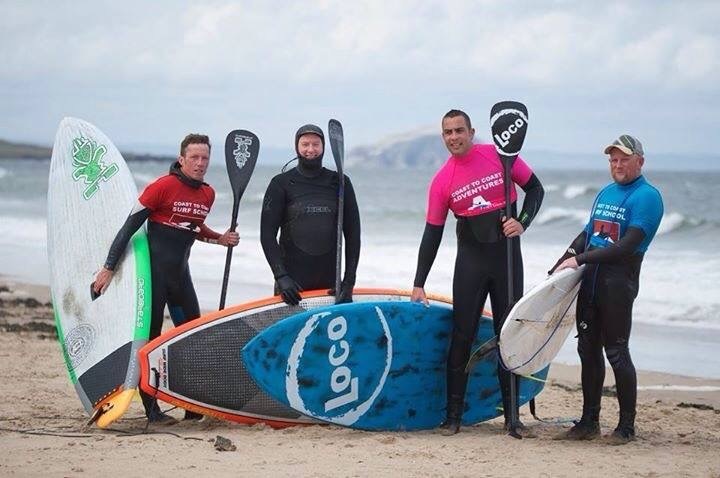 Many at the event reckon it was the kickstart to a more competitive future in SUP surfing in Scotland…..let’s hope so. Roll on next year’s competition! With endless empty waves and spots to choose from Scotland surely has to be a SUP surfing mecca that is waiting to be tapped. We look forward to hearing more about the growth of the competition scene in Scotland, and maybe in the future we can look forward to a surf series spanning across the country… from Cornwall to Scotland. One thing is for sure that with the Scottish enthusiasm for SUP, this will surely happen and when it does SUPboarder would love to be there to soak up the action and enjoy some great waves too! The future is looking good for SUP surf in the North. For more info and pics on the competition check the coasttocoastsurfschool Facebook page.